Minecraft is a surprisingly popular game. The design pays homage to block-like graphics of games from earlier days -- a time when a large amount of Minecraft fans weren't even born! We have the technology to make more lifelike environments, with curved edges and circles, but that would be blasphemy to the Minecraft community. "What's old is new" as some folks say, I suppose. 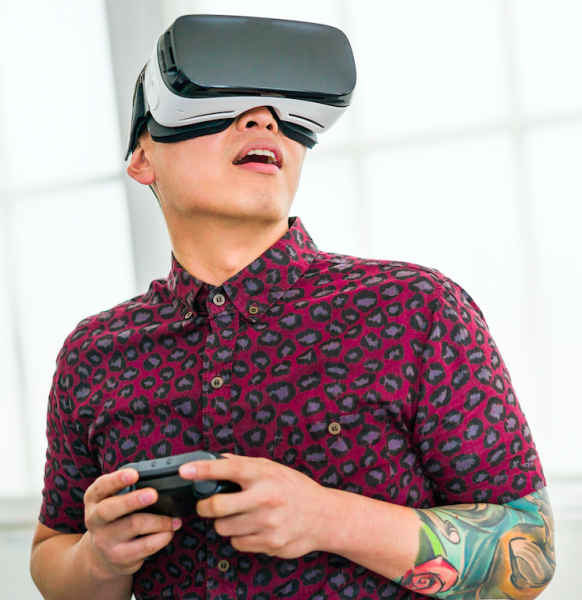 Today, The Oculus Team announces that it has worked with Microsoft to bring Minecraft to Samsung's smartphone-powered virtual reality platform, the Gear VR. Owners of this solution can now experience a more-immersive Minecraft experience, by leveraging Samsung's heasdset and a third-party controller. "Minecraft: Gear VR Edition supports all the features of Pocket Edition, including Creative and Survival modes, skins, and multiplayer. You can choose between the more comfortable default theater view or the more intense and immersive first-person view that lets you stand beside your creations", says The Oculus Team. John Carmack, CTO, Oculus VR, Inc explains, "Minecraft is a game that you can both figuratively and literally lose yourself in. In fact, my strongest memories of being inside VR are from the time I've spent exploring Minecraft on Gear VR. Experiencing it in virtual reality changes it from an abstract activity to a visceral one -- it goes from a sense of playing the game to one of being inside your world, and spinning around to find a creeper sneaking up on you leaves a powerful impression. Infinite worlds have been explored, shaped, and shared by millions of people, and now in VR; that sounds a bit like the fabled Metaverse". As you can see in the above video, the player can navigate the Minecraft environment with a Samsung Galaxy smartphone strapped to their head. While this is certainly cool, once you try a more mature VR experience like HTC Vive, the Samsung Gear VR is a bit ho-hum. A gamepad, while functional, simply wont deliver the immersion found with HTC's two-part controller solution. With that said, the HTC Vive is expensive and requires some beefy PC hardware, making the Gear VR a fun way to do virtual reality on a budget. Kids in particular should have a blast playing Minecraft with the Gear VR. If you want to buy it, head to the Oculus Store where it is available immediately for a reasonable $6.99.